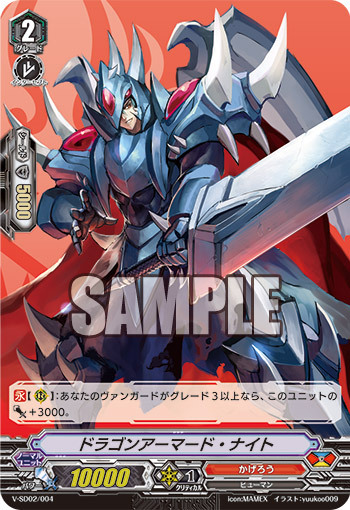 The Japanese card of the day is Dragon Armored Knight, from V-Trial Deck 02: Kai Toshiki. Originally debuting in the Vanguard manga, Dragon Armored Knight is one of the recurring members of Kai's lineup. AUTO [Rearguard Circle]: When it attacks a vanguard, if the number of your opponent's rearguards is 3 or less, until end of battle this unit gets Power +5000. Although we've already seen Dragon Armored Knight in the second Start Deck--currently on distribution as part of the Japanese 2018 Spring Caravan--this version of the card is more than a little different. The Start Deck card gained 3000 power while its owner had a grade 3 or greater vanguard; the Trial Deck verson instead gains 5k when attacking the vanguard, provided the opponent has 3 or less rearguards in play. Both version will be legal for play in Standard under the new rules, but the Trial Deck version is going to be preferable for several reasons, despite being more conditional. In terms of the new magic numbers, the most important thresholds to hit with your rearguards are 23k, 28k, 33k, and 53k. That's because 23k forces the opponent to guard with a Critical Trigger or better, 28k forces a Heal Trigger or better, everything between 33k and 48 has to be guarded with 2 or more cards, and 53k is completely impossible to guard with less than three guardians unless using a perfect guard. While the SD Dragon Armored Knight could only make a 23k column with Dragon Monk Gojo, TD Dragon Armored Knight makes a 23k column with any 8k booster--which will be most grade 1s in the new format. And while the new Dragon Armored Knight only works while the opponent has a reduced field, its purpose goes beyond just swinging for guard. Once the opponent is familiar with how Dragon Armored Knight works, they'll begin making informed decisions about whether to disable the ability or not. Dragon Armored Knight pressures the opponent to fill their field as much and as quickly as possible by forcing them to guard with 5k more shield as a punishment for leaving it open. That in turn reduces their available shield when they start dedicating cards to the back row, and exposes them to retire skills from cards like Dragon Knight Nehalem and Vortex Dragon. It also leaves them with a front row rearguard you can attack with Dragonic Overlord when the opponent is at a higher damage threshold where they aren't likely to let Overlord's attack hit the vanguard. That gives you the opportunity to hit, power up Vortex, and restand for a second swing. Ultimately Dragon Armored Knight's effect is that he progresses the game state, as the opponent comes to an equilibrium where playing their rearguards earlier will conserve more shield for them than if they had held back and have to guard for more from Knight. However, we have no real idea what Bahr's skill is going to be, and Kagerо̄ will certainly get other grade 1 and 2 options out of V-BT01: UNITE! TEAM Q4! that will affect how the final core looks. 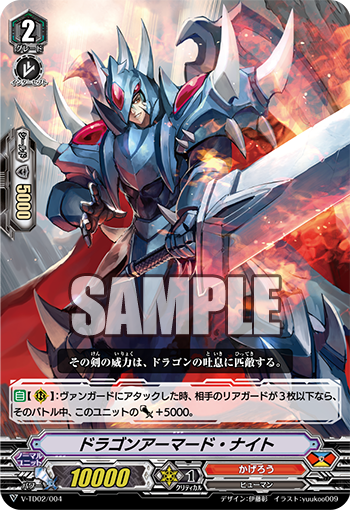 It's hard to imagine Kagerо̄ getting an attacker better than Dragon Armored Knight in the immediate future though--that would be giving them rearguard attackers on par with Jarron in Royal Paladin, when their vanguard has historically been the deck's focus. 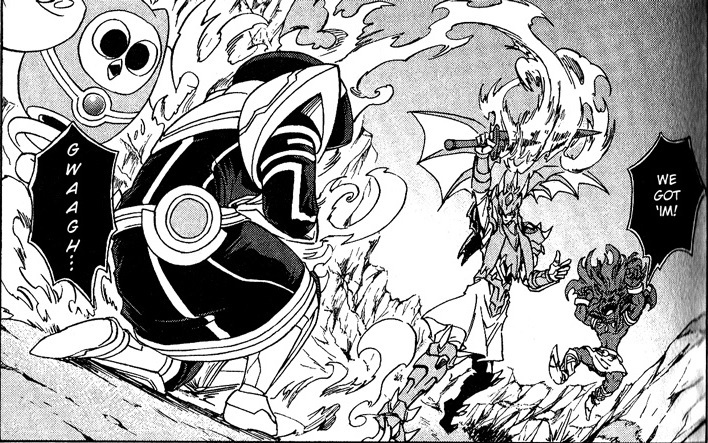 Dragon Armored Knight is designed by Itou Akira and illustrated by yuukoo009. The previous Japanese card of the day was the Little Sage, Marron.